Yes it can, but remember to practice safe swearing, kids! My children had some friends round for a playdate the other day, and as they were having a snack one of their friends asked them, very matter-of-factly, “Does anyone know the F-word?” I had just stepped out to the kitchen, and blustered back into the room loudly offering more snacks and a change of subject. Unfortunately, everyone’s attention was piqued, and I realised it wasn’t going to be that simple. “Is it ‘fart’? my daughter asked a little coyly. I was rather relieved, and frankly slightly amazed, that she hasn’t overheard me over the years. Another friend piped up “I think I know the S- and C- words.” I tried to hide my astonishment, but I can’t help but think, and hope, that in this friend’s mind those words were ‘shoot’ and ‘can’t’. I wasn’t about to wait to find out, as I offered more food to put in their mouths. Then I had four sets of eyes turned to me, as they realised that I of course, being grown-up, would know. “What is the F-word, Mummy?” asked my son. I aim to answer truthfully in all things, but I certainly wasn’t about to teach my children, let alone their friends, the worst swear words in the English language! I just said “It’s a word grown-ups use sometimes, and shouldn’t, but I’m not going to teach you it.” Of course lots of “why?”s ensued, but finally I managed to distract them with something else. I was relieved when their attention had moved on, but it did get me to thinking about the whole issue of swearing, and what I want to teach my children about it. Eventually they will learn all the F-, S-, C- words and more. But how do I want them to learn about them? Will I tell them swearing is wrong? Are there certain words I’m ok with, and others not? Then I realised in many ways I had already begun the process. If, like me, you have seven-year-olds at home, chances are they have already started the beginnings of swearing. I’m not saying they know the sorts of words we associate with swearing as adults, but my two are nonetheless fascinated by saying things that they are discovering are taboo. The number of conversations we have at the table where they start giggling uncontrollably because they are talking about poo or genitalia. They have learnt that the things they aren’t supposed to show in public are mightily hilarious to talk about in public. Isn’t that the root of most swear words? 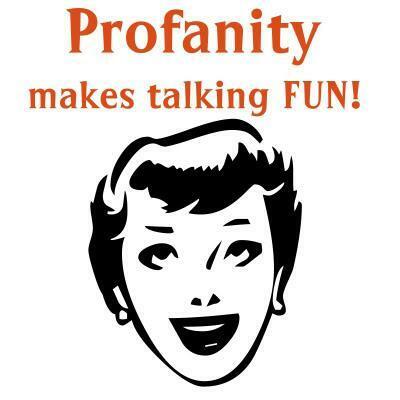 It strikes me that swearing is innate to humans from the moment they prefer to shut the bathroom door. I think there is a swearing spectrum, and wherever you place yourself on it should be what you teach your children about it. Personally, I never swear in front of people I don’t know extremely well. In private it’s fair to say I have a bit of a potty mouth (especially when I’m driving!) and my husband and I actually like to out-swear each other with innovative combos for fun. But I think only my husband and my closest friends know that about me. So for me, swearing is all about setting and context. limit it at the dinner table! I don’t like giving my children rules without explaining why I have them. It can be a confusing concept for children to understand that something can be wrong at certain times, and ok at others. I wondered whether it would be simpler for them just to learn that they shouldn’t be rude, and work out for themselves that they need to do it in private so that they aren’t overheard. But then I considered that they are already learning that there are things they can’t show or do in public. Some of these they are learning instinctively, like closing the toilet door. Others I have to teach more explicitly, like telling my daughter not to do headstands in a dress in a restaurant. The point is, they already are learning that we moderate our actions according to settings, so it stands to reason that the words we use to describe these things are also setting-dependent. Once I made the link between what they do and what they say, it made more sense to them. The difference is just that we keep the behaviours private for our own benefit, while we keep our language private for other people’s. I also explained that we don’t say these things in front of younger children because they are too young to understand these rules themselves. As for the dinner table, it’s just an extension of good table manners. This entry was posted in Perplexed Parenting and tagged cursing, kids, manners, parenting, Raising Kids, swear words, swearing, taboo on January 15, 2015 by perplexedparent.